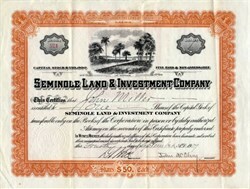 Beautifully engraved certificate from the Seminole Land & Investment Company issued in 1909. This historic document has an ornate border around it with a vignette of Lake Tohopekauga. This item is hand signed by the Company’s President and Treasurer and is over 105 years old. In 1909, The Seminole Land and Investment Company took over title to 35,000 acres of land ( St. Cloud Plantation ), a portion of which became the City of St. Cloud and its suburbs. On April 16, 1909, the Kissimmee Valley Gazette announced the “New Town of St. Cloud,” a “Soldiers Colony” that was to be located near Kissimmee. 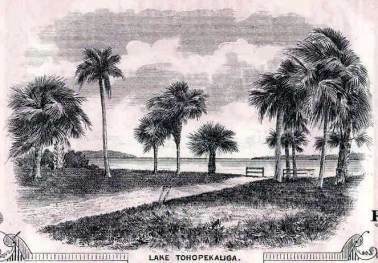 The newspaper called the purchase by the Seminole Land and Investment Company “one of the most important real estate deals ever made in the State of Florida.” It was reported that the officers of the company had searched all over Florida for the perfect site for a veterans’ colony, particularly one especially suited for “health, climate, and productiveness of the soil.” William G. King, an estate manager in Alachua Co. before becoming the first permanent resident of St. Cloud, was chosen by the National Tribune to “plan, locate and develop a town site for a colony of Veterans of the Civil War. He consulted with the Hon. William Makinson of Kissimmee, then local manager for SLICO, who placed the entire management of the new colony of St. Cloud in the hands of Mr. King” in April 1909.